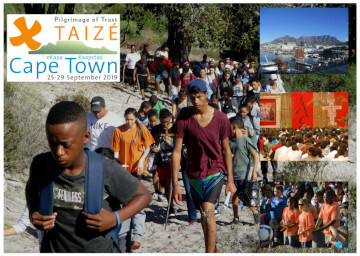 The next African stage of the Pilgrimage of Trust on the Earth will take place at the southern tip of the continent — in Cape Town, from 25 to 29 September 2019. Twenty-four years after the Johannesburg meeting and following meetings in Kenya (2008), Rwanda (2012) and Benin (2016) young people from Southern Africa and beyond are invited to set out to celebrate and witness together to their faith. Celebrating Christ, Source of peace and true reconciliation. Praying, singing, being in silence and sharing faith with thousands of other young people. Discovering people from different cultures and their lives. Experiencing the Church as a ferment of unity and communion in the human family. In holding this meeting, The Taizé Community is responding to a joint invitation from Church leaders, Archbishop Thabo Makgoba of the Anglican Church, Bishop Stephen Brislin, Catholic Archbishop of Cape Town, Methodist Bishop Siwa, President of the Council of Churches of South Africa, and Revd Dr. Gustav Claasen from the Dutch Reformed Church. 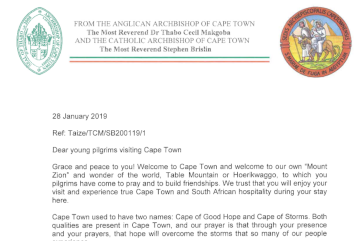 Since February 2018 several brothers of the community have been living in Cape Town to prepare for the meeting in cooperation with local church communities. The daily programme will include common prayers and times of sharing. The mornings will be spent in local parishes and communities, and from midday onwards participants will gather in a central venue. The participants in the meeting will be welcomed by the parishes and local communities. The youth will be accommodated by families with simple means. This personal contact will be an important part of the pilgrimage. Each day, around 11am, a shuttle bus service will transport participants from their host neighbourhoods to the central venue for the programme there. In the evening the same buses will take them back. Coming to the meeting in Cape Town involves a full participation in the programme and to prepare oneself in advance. Pray with the local Christian community or in a prayer group. This will help to make the journey a spiritual one in connection with the life of one’s parish, local Christian community or chaplaincy. Reflect along with others on the following themes: Making ourselves more available to others, to God and in the Church and also on the 2019 letter, Let us not forget hospitality. Learn some of the Taizé repetitive songs. Look around you for people who awake hope and visit them.